Phi and Arrow get real? Nokia's big Windows Phone 8 announcements next week just got a bit less surprising as photos of the Nokia Lumia 820 and Nokia Lumia 920 hit Twitter. Posted by @evleaks, fast becoming the bane of tech manufacturers' lives, the two handsets come with high quality photos but not many other details. The Nokia Lumia 920 looks like the higher-end of the two, apparently coming with PureView (which means a serious snapper) and a 4.5-inch screen. 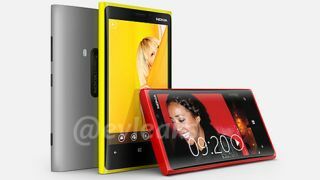 This could be the handset previously known as the Nokia Lumia Phi despite the screen-size discrepancy (Nokia commentator Eldar Murtazin said the Phi would have a 4.7-inch display). Looks like there'll be at least three colours available: grey, yellow and red (silly marketing-inspired names TBC). The Nokia Lumia 820 is slightly smaller, with a 4.3-inch screen and no PureView mention. The 820 is shown in a few more colours which we'll spell out for you here in case you can't see colour: purple, cyan, grey, black, white, yellow and red. Both handsets are likely to be running Windows Phone 8 given the big Windows Phone 8 and Nokia announcements that are scheduled for next week – as for more detailed interior specs, we'll have to wait for the official word (or the next leak). Of course, there's no guarantee that these images are for real so we recommend the usual dose of salt - but they look pretty darn legit to us.